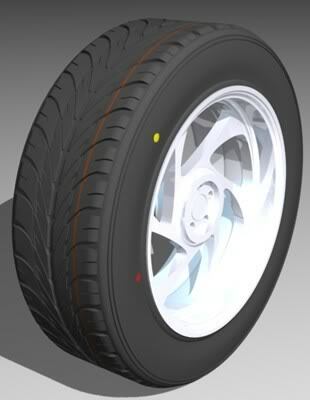 All new tyres have visible coloured markings which form a radial band on the tyre. They serve double purpose - who the tyres are intended to be made for if made by a secondary manufacturer i.e. non Goodyear/Bridgestone/whatever - as well as the softness factor of the tread wear face. More importantly, they indicate how the constructional layers of the rubber are laid upon the carcase during construction which affects the eventual way the tyre will run whilst in use. It's nearly impossible to make a tyre which is perfectly circular. You would be hard pushed to actually be able to tell that a tyre wasn't round without specialist equipment. Every tyre has a high and a low spot, the difference of which is called radial runout. Using sophisticated computer analysis, tyre manufacturers spin each tyre and look for the 'wobble' in the tyre at certain RPMs. It's all about harmonic frequency (e.g. the frequency at which something vibrates, for example a ruler on a desk edge or the Tacoma Narrows bridge collapse). Where the first harmonic curve from the tyre wobble hits its high point, that's where the tyre's high spot is. Manufacturers typically mark this point with a red dot on the tyre sidewall, although again, some tyres have no marks, and others use different colours. This is called the uniformity mark. Correspondingly, most wheel rims are also not 100% circular, and will have a notch or a dimple stamped into the wheel rim somewhere indicating their low point. It makes sense then, that the high point of the tyre should be matched with the low point of the wheel rim to balance out the radial runout. Once the rubber is laid upon the tyre constructional forms, it is 'vulvanised' in a mould where the soft rubber is cured into a useable tyre. Integral with the vulcanisation process is the use of 'release agents' to ensure the rubber releases properly from the mould. This is what gives a tyre its new shiny look but, more importantly, is what stops the tyre actually gripping the road properly until the shiny stuff is worn off. Take care with your new boots until they wear in, normally a few hundred miles. Once released from the moulds tyres are tested for various important balance/conformity factors. The dots on the sidewall typically denote unformity (how circular the tyre is) and weight (where the heavy/light spot is). It's impossible to manufacture a tyre which is perfectly balanced and perfectly manufactured in the belts. As a result, all tyres have a point on the tread which is lighter than the rest of the tyre - a thin spot if you like. It's fractional and you would never notice it unless you used tyre manufacturing equipment to find it, but its there. When the tyre is manufactured this point is found and a coloured dot is put on the sidewall of the tyre corresponding to the light spot. Typically this is a yellow dot (although some manufacturers use different colours just to confuse us) and is known as the weight mark. Typically the yellow dot should end up aligned to the valve stem on your wheel and tyre combo. This is because you can help minimize the amount of weight needed to balance the tyre and wheel combo by mounting the tyre so that its light point is matched up with the wheel's heavy balance point. Every wheel has a valve stem which cannot be moved so that is considered to be the heavy balance point for the wheel. Depending on how the belts are positioned during construction imperfections will allow the casing and the tyre tread to 'run out'. This disparity allows the compression of the tyre to steer the tyre laterally regardless of any actions taken by the driver thus generate a pull. The manufacture measures the degree of run out and marks the severity onto the tyre by the position of the outer band, typically the colour is Red or Blue, if the colour band is central then the run out is considered 0, if the band is toward the outer edge the tyre will need a 'reactive' partner to belay any pull. So the positions are vital to you and your car. 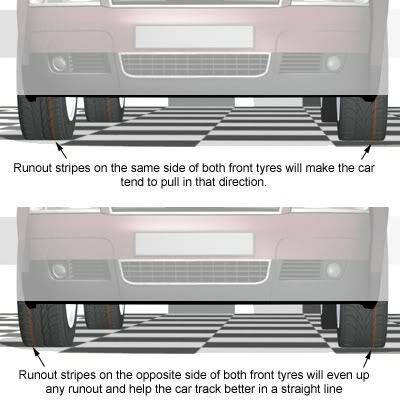 Realising this problem then it's easy to conclude if the tyres are symmetrical in tread construction, if the tyres are asymmetrical or directional then the centre will need to find a suitable match with an opposite reactive lateral partner.